The beta for DICE's upcoming Battlefield 3 recently closed. As an avid on-line shooter dilettante, I was excited to get a look at what seems to be a very important release for EA. 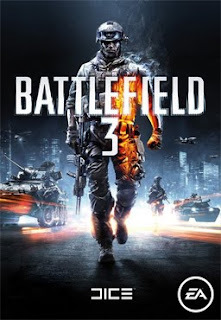 Battlefield is a long-running franchise, but this installment is being positioned to directly compete with the industry's reigning military shooter juggernaut, Modern Warfare 3. Designing a successful first-person shooter is difficult; designing one that works well enough to capture the console audience is even more so. Will Battlefield 3 be able to pull this off? It's hard to tell, but to be honest, I'm not optimistic. I've been in a bit of a visual design mood lately, and because of this, certain aspects of BF 3's visual presentation stood out. Complex, fast-paced games need readable, navigable on-screen information systems, especially on a console where control inputs are limited. Unfortunately, BF 3 does a sub-par job of conveying crucial information. The in-game HUD is pretty, but its symbols and numbers could be redesigned to be more readable. Instead of denoting grenades with "G," why not use a widely-recognizable pictogram? Implementing this symbol would also allow for multiple grenade types with different physical profiles. It took me a while to figure out that the three dots near the ammo count represent the gun's firing rate. Changing them to be shaped like bullets would have communicated their significance much more quickly, as it would be clear that a group of bullets meant auto-fire while a single-bullet meant a single shot. The health percentage number is interesting, but is usually irrelevant, as a few bullets is enough to kill you and your health is also denoted by visual distortion. A simple health bar would have sufficed and had the added bonus of offering a visual representation of how damaging a particular attack is, rather than forcing the player to try to keep track of the numbers in their head. 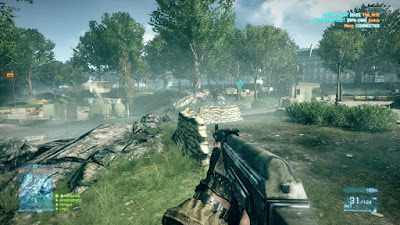 Much of the game's encounters hinge on seeing enemies from afar and constantly monitoring distant terrain. Unfortunately, the mini-map's position in the lower-left corner of the screen draws your eyes away from the horizon. Of course, this may be by design, but it still makes maintaining situational awareness difficult. The loadout screens also fail to make practical use of screen space. When cycling through weapon and item options on the class selection screen, you have to press a button to display the possible options for each weapon and piece of hardware. The menu that pops up inhabits what was previously empty space, so why hide it in the first place? Similarly, the more detailed weapon views only show you one weapon and one set of accessories at a time. Getting a description or changing require button presses that completely replace what you just had on the screen, thereby making it difficult to compare equipment without inadvertently changing it. Making more efficient use of space by employing pop-up menus or multiple columns would be faster and more informative for new players. Large-scale communications problems also detracted from my experience. Jorge and I attempted to join each other for a game, but without an in-game invite notification system or the ability to back out to a lobby without quitting the entire game resulted in a comedy of errors. Even if you successfully team up with a partner, BF 3's huge maps and objective-focused rules make a anyone without a good headset a liability. Ideally, you could learn from your mistakes and modify your tactics after you are killed. However, the game's ridiculously zoomed-in kill cam act mainly as a showcase for how weird the game's animation looks from a third-person perspective. Of course, not all shooters need copy Modern Warfare, and I can see the philosophical argument against kill cams, but I'd rather have a static scorecard than the headache-inducing, jittery view that follows a death. Admittedly, these criticisms are very specific (some might say "nit-picky"). 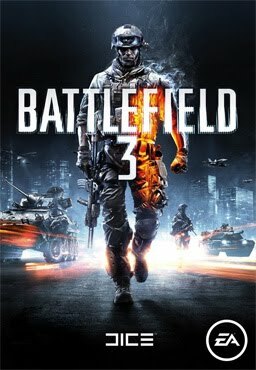 BF 3 is a solid game with impressive scope and I can see its appeal. However, when you're trying to go head-to-head with Modern Warfare, simply being "solid" doesn't cut it. A polished experienced is crucial, especially in the console space where other colossi like Halo and Gears of War roam. Some of the problems you cited are holdovers from BC2: namely the absence of a health HUD and the map placement. I can forgive the first one since, as you said, a few bullets kill you anyhow, and I kind of appreciate the immersive aspect of perceptually gauging if you're healthy enough to sprint out of cover before taking a few more bullets. A lot of the cryptic design decisions for the HUD in general, however, worry me. We'll see if people eventually assimilate them like they did in the previous titles. The weapon selection in BC2 was quite a bit clearer with the iconography, but still a little off-putting to newcomers. Once you get the "flavor" of this game and have the experience of successfully operating in a good squad, a lot of these niggling UI problems cease to carry as much weight. That's the meat of the multiplayer in Battlefield, anyhow, even in "capture the flag" (Conquest) games: the squad tactics and knowing how to play your role. But it's hard to get to the meat of the game when it's surrounded by obscure UI design. I totally agree. I've always loved the Battlefield games, but alas the series has been know for a lot of small bugs and bad design decisions (especially on launch). Even though it was only a beta (some would call it an early demo), the general feeling was in-responsiveness (if that's a word). For instance, I often had to click the spawn button numerous before my soldier spawned (even though the counter says it's ready). Another thing I disliked was the fact that each team got its own set of weapons. It took me a while to figure out why my upgrades sometimes didn't showed up (you switch team each round). I can't see the readon why you should have different weapons for each faction, since they in all other regards are so similar. There are virtually no differences between the teams. It made it very hard to distinguish friend from foe - I could only spot the difference by looking at the name's color. And sometimes the name tag wouldn't be shown immediately, which resulted in him killing me first. In Battlefield 2 it was easy to tell a sniper from a medic and a US Marine from a Chinese soldier. I thought BF2 was a brilliant game (despite its many bugs). BF3 feels too much like Bad Company, and worst of all it tries to mimmick Call of Duty with its focus on infantry combat. To me, Battlefield is more about the big epic wars with tons of vehicles, teamwork and a general feeling of being one cog in a big wheel. It's not so much about the individual kills, but more sbout the feeling of team spirit when you fly around with your buddy in a helicopter or when you revive your squad as a medic. I definitely agree about the "meat" of the game being squad and tactics-based stuff, which makes it even weirder that they are marketing it as a direct competitor to Modern Warfare. If you want to compete with that Goliath, you have to be perfect! It's a shame, since I think the Battlefield set up is an interesting alternative to Modern Warfare that suffers from trying to be something it isn't. Great points about the different weapons and shadowy distinction between teams, as well as the general janky feel of the whole thing. Hopefully this is more of a true beta than a marketing gimmick, but I can't shake the feeling that BF 3 is shooting itself in the foot trying to be some sort of weird hybrid between BF 2, Bad Company, and Modern Warfare. Might as well specialize in something than be sub par in many things, right? Well, I gather the BF3 console port is embarrassingly lacking in terms of maps, graphics, players etc. That wouldn't be so bad except it also doesn't seem to have any kind of local matchmamking, so if you're anywhere but the US, you'll constantly be connected to laggy US-hosted matches anyway. Making it nearly unplayable. And on PC you have to contend with compulsory Origin (and EA getting to dig through your HD) and the apparently god-awful Battlelog browser system. Oh, and EA online pass so that I can't onsell my copy of this mainly multiplayer game when I'm finished with it. On the plus side, deciding not to buy it because of all this nasty anti-consumer crap feels really, really good. Almost principled. Yeah, I'm not exactly surprised that the PC to console transition looks to be a rocky one. Of course, as you point out, buying it on the PC comes with a host of technical and ethical irritations. It's been a long time since I've seen a launch handled so poorly. I wonder how many people will adopt your stance? "anyone who has done armed service knows that three dots means rapid fire"